Some products stand-out, offering great sound in a product we'd like to own. 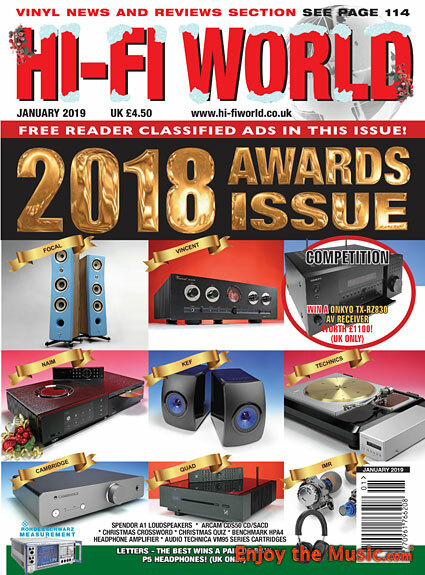 Here are our top products from 2018 � those with something special. 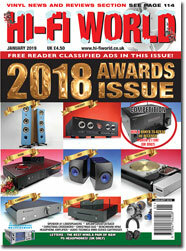 Read our original reviews of the products we have selected for award. You know about high fidelity? Here's a head-scratcher for Christmas � answer it whilst the turkey is roasting! Your chance to win an Onkyo TX-RZ830 A/V receiver worth �1100. Reviewers Martin Pipe, Dave Tutt and Paul Rigby tell us what they'd like for Christmas. Here's a goody list for your other half perhaps! If you like crosswords, you might like to try our high fidelity version for Christmas. For better sounding answers! Jon Myles listens to Spendor's new, small yet sophisticated miniature loudspeakers. A high-end headphone amplifier with THX certification and balanced XLR output. Martin Pipe takes a close look. A CD player with a top chip. It also plays SACD and streams from the net. Noel Keywood looks closely. Jon Myles checks out a tiny, inexpensive music portable. Not Hi-Res � but good all the same. Top loudspeaker cables � reviewed by Jon Myles. Noel Keywood spins vinyl with five new budget moving-magnet cartridges. Evenings With Led Zeppelin, a concert catalogue and more of the great band reviewed by Paul Rigby. Paul Rigby gets to grips with a new LP cleaning machine from the USA. FiiO release new quality in-ears at a low price. Jon Myles is impressed. Fotheringay's Caroline from 1970, by Paul Rigby.